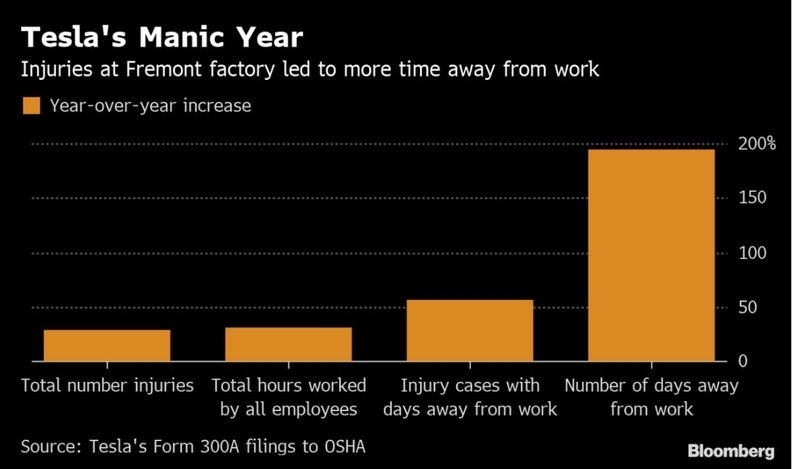 SAN FRANCISCO -- Tesla Inc. factory employees spent almost three times as many days off the job because of work-related injuries and illness in 2018 as the year before, an indication of just how much strain they were under as they manufactured electric cars at scale for the first time. Safety has long been a flashpoint between the company and its critics, with some current and former employees saying CEO Elon Musk prioritizes production goals over injury prevention, an allegation the company denies. Tesla is appealing several citations from California’s Division of Occupational Safety and Health, including a proposed $82,000 fine related to a subcontracted employee whose fingers were caught in a torque gun. Two-thirds of the injuries last year were cumulative trauma, Shelby said. These are ailments related to repetitive stress on areas of the body including the neck, shoulders, back, wrists and hands. Other safety advocates are less impressed. Tesla’s reported spike in missed days is “a pretty dramatic trend,” said Peter Dooley, a consultant for the National Council for Occupational Safety and Health. “That’s an indicator of real serious problems,” said Dooley, who coordinated educational programs for the UAW, which has more recently been trying to organize the Fremont factory.